Halibut fishing is among the most popular types of fishing in Alaska. At Anglers Adventures & Outfitters, we want to make your halibut fishing trip the experience of a lifetime. Anglers Adventures & Outfitters offers private and guided halibut fishing charters that can be done for full day and even multi-day excursions. If you ever want to truly experience Alaska, a halibut fishing charter is just the ticket. Halibut fish are extremely popular among Alaskans and vastly contribute to our local economy here in Ketchikan. If you are an experienced angler, it’s likely that halibut fishing is one of the top items on your fisherman’s list. Halibut fish can be large, some weighing over 150 pounds. The average weight of a halibut fish is anywhere from 15 to 20 pounds. These fish are flat, easy to season and cook, and are rich in nutrients. They are also strong fighters and it can be a great joy to catch one in the Alaskan waters. Sport fishing for halibut in southeast Alaska is at the top of a lot of peoples bucket lists. If you are wanting an experience of a lifetime, halibut chartered fishing with Anglers Adventures & Outfitters is the right charter for you. Our charters cover everything you need for a great day out on the water. Halibut fish are bottom feeders and prefer deep waters. Our chartered boat is ideal for halibut fishing. The F/V Sierra Dawn comes equipped with all the essential, state-of-the-art gear to put you in the best position to make your big catch. We provide all of the bait, tackle and lures to make your trip as promising as possible. While all the gears and gadgets are great, nothing compares to the experience that your captain will create to place you in the right position. 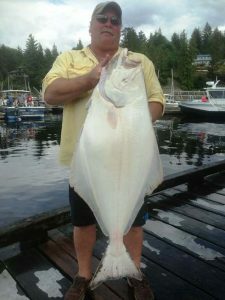 With over 26 years of experience in halibut fishing charters, he believes that your success is also his. He is filled with knowledge and advice to give you the best experience possible. While you are fishing, our charter keeps you nice and comfortable. Our charter boat includes a heated, enclosed cabin as well as a private bathroom. Plenty of drinks and snacks will keep your bellies full as you are having the time of your life. For more information about our halibut chartered fishing boat in Alaska, please feel free to visit us online or give us a call! Anglers Adventures & Outfitters is the perfect choice for anyone looking to have a great adventure out on the water. For more information, feel free to call us today at (907) 254-0880 or send us an email at brian@anglers-adventures.com.